After the success of 'Romeo Juliet' and recently released 'Sakalakala Vallavan', Jayam Ravi is back with his next big movie 'Thani Oruvan'. Jayam Ravi's 'Thani Oruvan' directed by his brother Raja has been cleared by the Censor Board with a clean 'U' certificate. The film starring Jayam Ravi, Nayanthara and Arvind Swami in lead roles is a racy action packed entertainer. Nasser, Ganesh Venkatraman and Nalini are also part of the star cast and the teaser has been receiving good response from the audience. Bollywood actress Mugdha Godse is paired opposite the film's antagonist Aravind Swami. Earlier it was announced that movie will release on Independence day, but now it is scheduled to release world wide on August 28. Movie went to censor board today and came out with clean 'U' certificate. After a long gap Arvind Swamy will be playing an pivotal role in this movie. Understanding that he needed a serious makeover, Arvind Swamy took a drastic move and has shed his goody goody avatar by playing a sly villain in Jayam Ravi-Nayanthara starrer Thani Oruvan. The teaser of the film is out and right from the start of the teaser we know that Arvind Samy’s villainous role is on par with Jayam Ravi’s character. While leading lady Nayanthara does a blink and miss in the teaser, Jayam Ravi impresses as a super fit cop. But it is Arvind Swamy, who steals the thunder with his suave bad guy act, leaving you surprised with his menacing dialogue delivery. 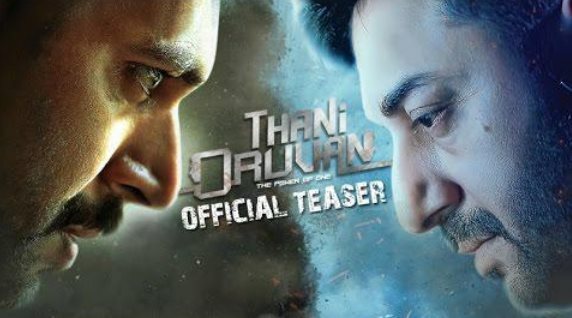 Throughout the teaser, we get to hear some memorable dialogues as Jayam Ravi and Arvind Swamy are engrossed in a one-liners battle. The film being an action-entertainer will be laced with romance. Nayan will play a cop in the film. HipHop Aadhi is scoring the music for the film and Ramji is handling the cinematography. AGS Entertainment has produced and releasing the film on their own. Jayam Ravi and Raja last worked together in Thillalangadi, which was a remake of the Telugu hit, Kick.